You can choose any individual Printable Business Form Template and download it for free, such as the Accident Claim Worksheet. This free business form is a DOC file (which you can view, edit, and print with Microsoft Word). Just download it, enter your information to customize the form and fill it out, and print it. 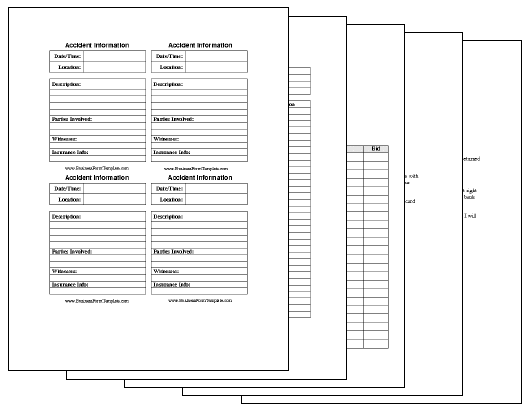 The $47 Printable Business Form Templates Collection includes every business form template from this site—that's 1,450 different printable business form templates. They are DOC files, so after you download it, all you need is Microsoft Word (or other compatible word processing application) or a Google Docs account to open it, customize and edit, and print one business form or print them all. You'll also get PDF versions of most of the templates. You can pay using your PayPal account or credit card. You'll be able to download the Printable Business Form Templates Collection within moments. All Printable Business Form Templates require Microsoft Word, a Google Docs account, or another program that can display the DOC file format.